I was worried that the pomegranate sauce might clash with the buerre blanc, or just create too much of a sweet note, but that didn’t happen. They worked marvelously together! I could swim in buerre blanc, it is SO good. Look at those gorgeous scallops! I had too much fun plating this and bless Terry’s heart, she is so patient. I have to get my pictures in before we eat, so often times she’s just sitting at the table waiting for me to get the shot I need and join her for the meal. I was so excited with how this looked, and when I tasted it, I nearly went through the roof. Every so often, I put out something just so amazing that I can’t even believe I made it myself. If I had a restaurant, this would totally be on my menu. It was so good, I can’t wait to make it again. I love it when something comes together and I get so excited about it, it just makes me want to keep pushing myself to do better every time! If you want to make this for a dinner party, par-cook the risotto earlier in the day. You could also make the pomegranate sauce earlier too, and then reheat over the stove. The only thing you’d have to do last minute is sear the scallops (make sure your pan is screamin’ hot or you won’t get that beautiful sear), and make the buerre blanc. Depending on how far you cooked your rice, you may only need 5-10 minutes to finish it off. Plenty of time to get the scallops and buerre blanc done. To serve, heat your dishes in a 200 degree oven so they are warm. This will help keep the risotto and the buerre blanc sauce from seizing up. 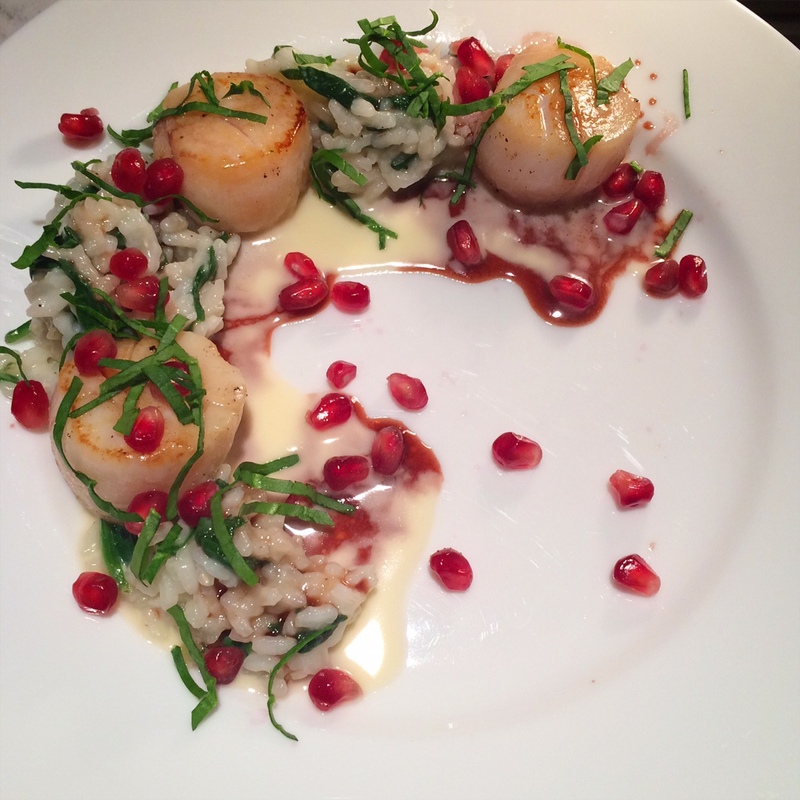 Sauce the plate with the buerre blanc, then layer on the risotto and the scallops. Be creative with your presentation – you could plate this so many different ways. 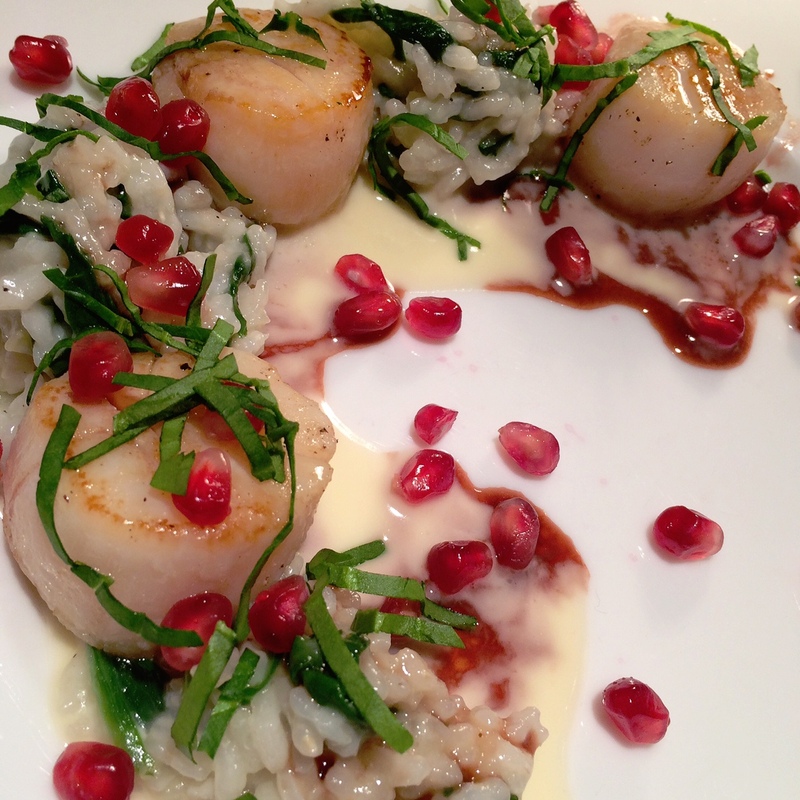 Top with the pomegranate sauce and seeds and garnish with a chiffonade of spinach. Voila! 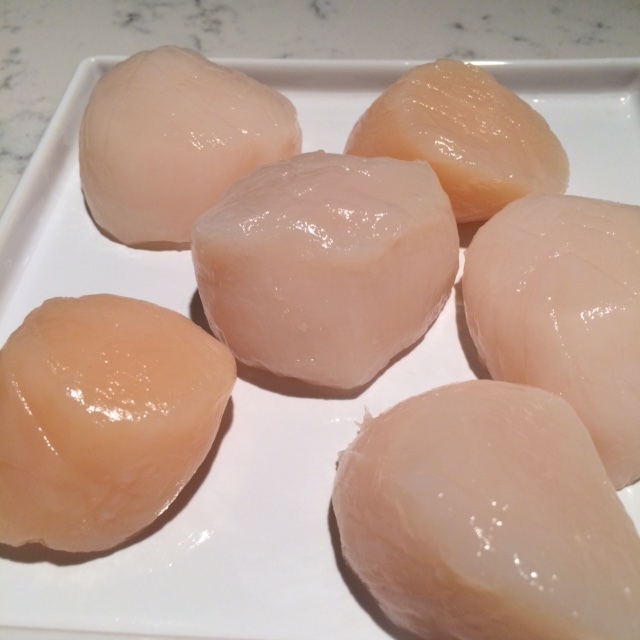 Tip: allow your scallops to come up to room temperature before searing. This way they won’t constrict when they get in the hot pan. You will have leftover of both sauces. If you have leftover risotto, put some of the buerre blanc in with it. To use the pomegranate sauce, reheat in a pan on the stove over low heat. Mix well to reincorporate the ingredients. For the risotto: Heat the olive oil in a large skillet over medium heat. Toss in the onion and cook until almost translucent, about 6 minutes. Add the rice and mix in to coat. Deglaze the pan with the wine, and cook down until it is fully absorbed. Add 1 cup of the stock at a time, seasoning with salt and pepper until the rice is al dente. When the rice is almost done (about 25 minutes in), add the fresh spinach, cheese and 2 more cups of stock. When the spinach has wilted and been well mixed in to the risotto, turn the heat to low to keep warm until you serve. For the pomegranate sauce: Put all ingredients in a medium sauce pan and bring to a boil. Let boil for 5-10 minutes and then reduce to a simmer until the sauce has reduced by almost half, about 30 minutes total. Taste as you go – you may not need the full 30 minutes to reduce depending on the flavor and consistency you want to have. Strain the sauce and keep warm in a pan until ready to use. My new favoritest, good-looking best tasting dish. Bon Appetit!